Graydon George H. (Published for) . Great Ravine Bridge, Edmonton, Alta.. Edmonton: Published for Geo. H. Graydon, Edmonton, Alta, cca. 1910. Description: View of a bridge over a creek. On Back: "[printer's no.] T.O. 257-2"
On Back: "Printed in Germany"
Physical description: 1 postcard : b&w ; 9 x 14 cm. 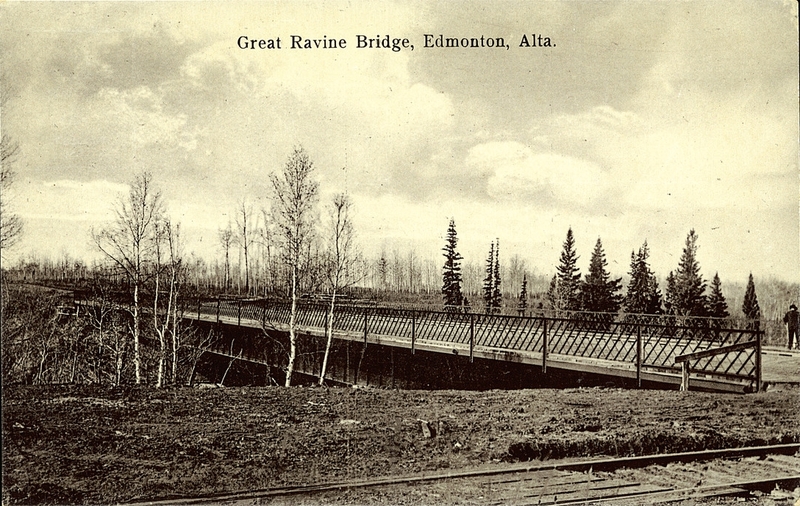 PC013895: "Great Ravine Bridge, Edmonton, Alta." is licensed by University of Alberta Libraries under the Attribution - Non-Commercial - Creative Commons license. Permissions beyond the scope of this license may be available at http://peel.library.ualberta.ca/permissions/postcards.html.